The end of EsportsWikis highlights a problem that Riot must solve. My mother doesn’t exactly understand what I do for a living. To be fair, it’s a bit of a convoluted explanation: I work for several clients, and collect several incomes. It all falls under the same umbrella: I professionally write about competitive gaming and esports. Sometimes this means I write human interest stories, sometimes I write recaps, and of course I write Rift Tales here at PC Gamer. I don’t bring this up to brag, but to provide necessary context to my upcoming plea: League of Legends has an archival problem, and the Esports Wikis situation has revealed just how deep that goes. EsportsWikis is a community resource maintained by RheingoldRiver and her team. “Was” may be the more appropriate word here; River and her team have parted ways with their investors, GAMURS, after GAMURS took a large loss on the wikis. Well, in this capitalist world, what’s there to be done, right? The problem is that EsportsWikis was a massive resource for League that was relied on by Riot staff. Here’s Deficio, EU shoutcaster and analyst, wondering who will pick up EsportsWikis’ slack. Froskurinn, color caster for the LPL, notes that EsportsWikis is the only resource that correctly tracks important details for the region. To say that losing EsportsWikis is a shame for League of Legends is an understatement; it verges on a crisis. My colleagues at the Rift Herald have penned an eloquent call to arms to Riot, hoping that the devs themselves can save River’s efforts. I’d like to go one step further and explain why the proposed alternatives to EsportsWikis aren’t going to work out. My mom isn’t quite sure what I do for a living, but there is one time we connected over my work. I decided to stop trying to explain it by bringing up my employers or my workload, and instead, I told her a story. I told her the story of Piglet, a young boy who would sneak out of his parent’s house in Korea to practice in PC Bangs. I told her about how his dedication paid off, and his skill in solo queue garnered the interest of SK Telecom T1. He went from sneaking out and hoping his parents didn’t find out to playing under the banner of a team sponsored by a major media company. This was something that registered with my mom. We fought my entire teenage life (and the adult years I lived under her roof) because, well, I played too many video games. Sure, I never got signed by SKT T1, but I eventually earned a living. My mom understood the struggle. I told mom about Piglet and Poohmandu, the Thousand Acre Lane, and the relationship the two players shared. I described the success he found, finally becoming World Champion and standing triumphant on the international stage. I even told her about his “fall” to NA, where he’s struggled to make progress with Team Liquid. I shared the beautiful parts and the tragic parts of Piglet’s story with my mom, and she understood it and connected with it despite never playing a game more complicated than Centipede in her life. Here’s what I did not share with my mom: Piglet’s gold per minute ratio. His CS at ten minutes. I did not go into detail about his champion diversity, nor how often he was target banned. Of course these stats are valuable, but they’re not something that captures the human, emotional element of League of Legends. EsportsWikis wrote and catalogued these histories, often where no one else did. There are so many pieces of League of Legends history that are just gone, lost to the ages. Twitter threads, Twitch vods, and Reddit comments disappear to the sands of time, and we’re left with half remembered memories and urban legends. Many sites have stepped up in the wake of EsportsWikis, including GAMURS, offering alternatives... and nearly all of them have focused on the stats that EsportsWikis have offered. “Fun facts” and written histories of players aren’t just fluff that fill out a page nicely, they’re critical to League’s history. Here’s where my appeal turns to the “Riot pls” side of things. In many ways, Riot has worked hard to make the game, and its players, accessible to fans and media. 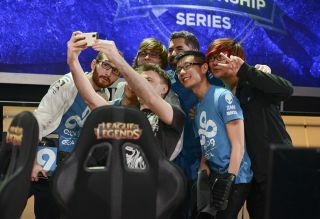 If I need pictures of, say, Cloud9 during the Spring 2016 Split, I can head to Riot’s lolesports flickr page and peruse a free, high quality library of images. I can reach out to Riot’s PR staff and they’ll happily arrange an interview with one of their developers. Even the LCS itself was a massive investment on Riot’s part that was designed to make League esports open and accessible to the common person. It’s time to step up that commitment and start working on preserving the history of League’s players and pros. This doesn’t necessarily mean picking up River and her staff for a Riot wiki (although that would be a welcome and wise move), but it does require some kind of action on Riot’s part. Even an easily accessible archive of all written features, past and present, with the season they were published during and some context, would be a step up. This is something teams should be getting behind too. Team SoloMid doesn’t want to operate in a world where no one knows what Baylife is, or who Dyrus was. Cloud9 wants to continue to draw on their rich history as a dominant North American organization to connect with new fans. This becomes dramatically harder if the LCS’s history slowly fades away over the years, captured only through video promos and caster banter. The debate is long since buried: esports is a real, legitimate venture that deserves our time and respect. That comes with a greater responsibility for cataloguing its history. With EsportsWikis in the balance, now’s a fantastic time to start.